If you are one of the thousands of athletes that simply can’t imagine working out with anything other than your New Balance shoes, you are not alone. New Balance is a leader in performance-enhancing footwear, and their cross-training shoes are no exception. Their shoes are not only stylish and long lasting, they also provide exceptional balance and stability even during CrossFit’s lifts and squats. Read our buying guide packed with information to help you decide if a pair of New Balance Cross-Trainers is right for you. Their shoes are designed for comfort and support, and their shoes are also available in a wide range of sizes. With New Balance, you can easily go from lifts and squats straight into your runs, making them perfect for any of the CrossFit competitions you might decide to enter. 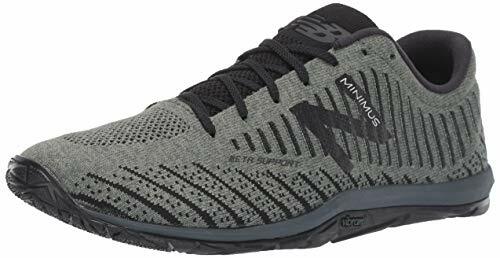 You can look great, perform better, and have shoes that fit comfortably with any of our picks for best New Balance cross-training shoes for men. New Balance is one of the top brands in the business when it comes to training shoes. Here are some of the top picks for New Balance Shoes for CrossFit. MX20 Minimus Cross-Training shoes are lightweight and durable, and they give you the perfect platform for all of your lifts and squats. Power through any of your WODs, or use them for all of your endurance training. With a cushioned midsole for comfort and support, you’ll be able to cover any of your off-road runs, and the 4 mm heel-to-toe drop gives you the extra lift you need for your deadlifts and squats. Available in several different colors including plain black and even in wider sizes, these shoes will get you through all of your interdisciplinary workouts. Seriously, wear them to the gym or your CrossFit Box and you’ll get a ton of compliments from people wondering about what kind of shoes these are. Is this shoe ideal for a CrossFit type workout? You’ll be doing lots of running, jumping, lifting and climbing. We certainly recommend sticking with a crosstrainer like this one because you’ll want a shoe that can handle all these things easily. The New Balance minimus cross-trainer is one of our top products for this kind of workout. If you love running barefoot, then this shoe’s barefoot design will appeal to you. The shoe’s lightweight design will never slow you down, and the Vibram sole will give you the traction and stability you need to run over any terrain. It can also easily switch over to your power lifts and lunges. The shoes feature no seams or stitching, making them even more durable than other minimalist running shoes. Available in several fashionable colours, these shoes will let you feel like you are running barefoot while still being able to switch to other strength training exercises. If you’re looking for a reasonably priced crosstraining sneaker that’s ideal for a CrossFit workout, then you’ll want to consider the New Balance 857. This is particularly true if you roll your feet inwards when you move because these shoes have some nice stability and arch support. With a heel to toe drop of 10mm, these shoes are closer to a running shoe than anything else. This means that you’ll do well with them for workouts heavy on the sprints or cardio. However, if you’re looking to lift some serious weights, they may not be right for you as you’ll want a flatter shoe that’s under 5mm. Consider the Nike Metcon 4, or Reebok Nano 8 instead. These shoes come in quite plain styles and colors, which may make them ideal for work when you’re on your feet all day. For example, a nurse or ER doctor, or in a restaurant. New Balance shoes are designed to enhance your performance through all of your daily workouts. Available in several different sizes, including wider ones, finding shoes that fit suddenly got easier. What’s your top pick for workouts shoe from New Balance? Leave a comment below and let us know what you think.